පල්ලාස්ගේ බළලා (Otocolobus manul), හෙවත් මැනුල් යනුවෙන් හැඳින්වෙන්නේ මධ්‍ය ආසියාවේ තණබිම් සහ කඳුකර ස්ටෙප්ස්හි හමුවන කුඩා කැළෑ බළල් විශේෂයකි. වාසභූමි හායනය, ගොදුරු අල්ප වීම, සහ දඩයම් කිරීම නිසා මොවුන්ගේ පැවැත්මට බාධා එල්ල වී ඇත. එමනිසා 2002 සිට මොවුන් IUCN තර්ජනයට ලක්වීමට ආසන්න විශේෂයක් ලෙස නම්කොට ඇත. ↑ 1.0 1.1 Ross, S.; Barashkova, A.; Farhadinia, M. S.; Appel, A.; Riordan, P.; Sanderson, J. & Munkhtsog, B. (2016). 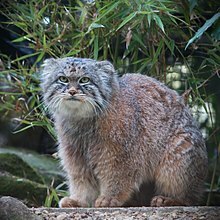 "Otocolobus manul". The IUCN Red List of Threatened Species. IUCN. 2016: e.T15640A87840229. doi:10.2305/IUCN.UK.2016-1.RLTS.T15640A87840229.en. සම්ප්‍රවේශය 15 January 2018. ↑ Wozencraft, W. Christopher (16 November 2005). "Order Carnivora (pp. 532-628)". මෙම කෘතිය තුල: Wilson, Don E., and Reeder, DeeAnn M., eds. 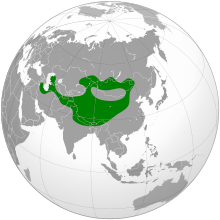 Mammal Species of the World: A Taxonomic and Geographic Reference (3rd සංස්.). Baltimore: Johns Hopkins University Press, 2 vols. (2142 pp.). පිටුව. 535. ISBN 978-0-8018-8221-0. OCLC 62265494. http://www.bucknell.edu/msw3/browse.asp?id=14000043. පල්ලාස්ගේ බළලා හා සබැඳි මාධ්‍ය විකිමාධ්‍ය කොමන්ස් හි ඇත. මේ පිටුව අන්තිමට සැකසුවේ 28 පෙබරවාරි 2018 දින දී, 14:32 වේලාවෙහිදීය.